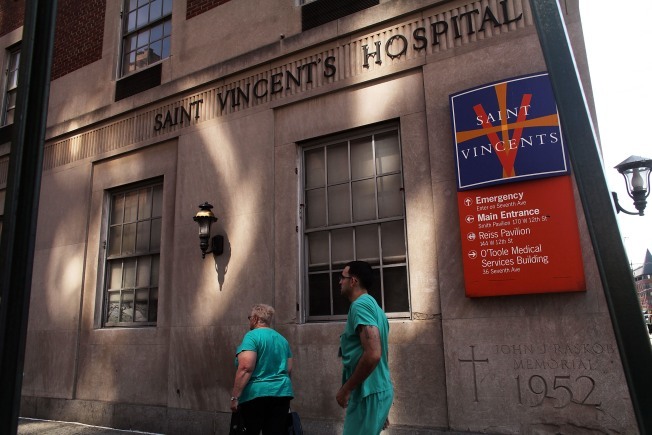 Hospital employees walk by St. Vincent's Hospital on April 7, 2010 in New York City. Baby Abigail Jancu of Forest Hills, Queens is only a day old, but she is now an important part of the 160 year history of a shuttered New York institution. The Greenwich Village hospital filed for Chapter 11 bankruptcy last month and stopped admitting patients on Wednesday. hospital on Wednesday who told them that if they wanted to deliver their baby there, they would have to hurry. The family had to rush in order to catch the only remaining anesthesiologist, who would not be there past Thursday morning. “They said, if you come here early in the morning, we’ll get you in, but we’re closing down,” Robert Jancu, 44, told The New York Times. The six-pound, 15-ounce Abigail, who was due April 6th, was born just before sunrise on Thursday morning. The staff, which included nurses and doctors who will be out of work in a few days, cried tears of joy and sadness over the last birth at St. Vincent's. "Everyone was saying, 'We will remember this moment," Robert Jancu recalled to the NY Post. "'This is our last baby. Don't rush it,'"
He told the paper that someone later gave him two packs of diapers, saying they'd rather give them away than have them gobbled up by bankruptcy.